NASHUA, N.H., Skillsoft, a global leader in learning and talent management, today announced the winners of the Innovation Awards at its annual user conference, 2015 Global Skillsoft Perspectives. The winners, which include National Aeronautics and Space Administration (NASA), Acosta Sales & Marketing, Deltek, the United States Air Force, the United States Department of Agriculture (USDA) and Fallon Health were honored for achieving outstanding business results through Skillsoft and SumTotal Systems learning and talent solutions. 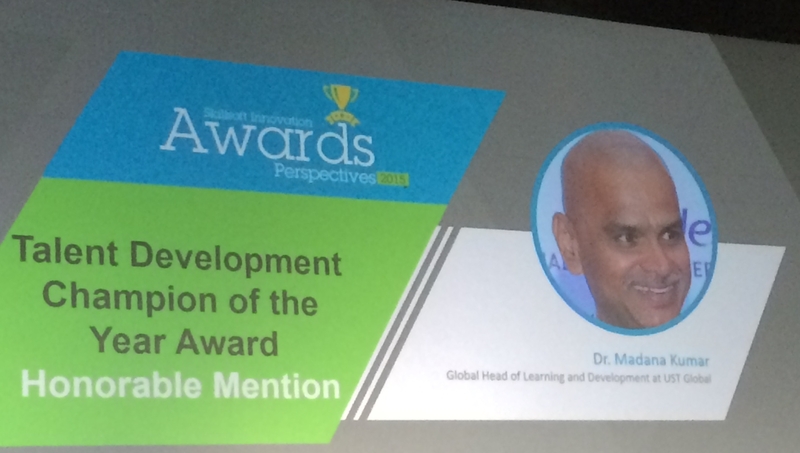 Additionally, Dr. William (Bill) Behrendt, vice president of human resources at the University of Texas Southwestern Medical Center, and Dr. Madana Kumar, global head of learning and development at UST Global, were recognized as Talent Development Champions of the Year. The awards were judged by an independent panel of industry experts, including IDC, Brandon Hall Group, HfS Research and Elearning! Magazine. Held in Orlando, Fla., this year’s Perspectives was the company’s largest user conference to date. More than 1,200 attendees from best-in-class organizations around the world converged to share insights on how to improve organizational performance by improving the performance of an organization’s people. “The Innovation Awards at Perspectives is a celebration of Skillsoft and SumTotal Systems customers that are pioneering the best learning and talent strategies. These customers underscore the value of weaving learning into the fabric of their organization’s culture to empower their people and achieve business success,” said Jerry Nine, chief operating officer at Skillsoft. “We congratulate this year’s winners, who demonstrate that business leaders across the board are striving to attract and retain top talent through delivering learning and development opportunities that make employees value their organization as much as the organization values its employees. Each year, Skillsoft honors the winners for their significant achievements in talent development, recognizing innovative ideas and inspiring leaders who are helping to transform the learning landscape. Quoted from the Company’s submission to the award committee. Business Connect: To ensure business connect, he established a learning engagement team which acts as SPOC for all learning needs across organization. This has tremendously improved our on-demand training and also improved internal perception of learning needs by 50 per cent. Empowering Lives through technology: Step It Up America as explained above, is an initiative to transform lives in the community that we operate in. Our CLO is successful in arriving at an appropriate blended program solution for the design and delivery of Step It Up America. Support in Organizational Priorities: To support the organizational priorities of increase in revenue generation, delivery excellence, enablement of people management skills, etc., 17 priority programs were designed and implemented in accordance with views from senior leaders and business leaders. To save organization cost, he implemented various measures like Resource deployment through training instead of external hiring. Learning Penetration: In two years of his helm at UST Global, we saw an outstanding increase of 280 percent in e-learning hours and, 181 percent increase in overall training hours – from 2012 to 2014. All these figures testify to his efforts to improve learning penetration in our organization. Employer Branding : Employer Branding being the key enabler in our strategy, our CLO has taken personal interest in improving employee branding and participated voluntarily in external media e.g. his interview featured in HR Magazine of PREMIER B-Schools like IIM Shillong ,MDI Gurgaon, TISS etc. he was Celebrity speaker at Timesjob.Com, NHRD summit , Bangalore HRD summit of IHRD. CLO contributed significantly in various international awards. We won the “Skillsoft Innovation Awards 2014, CLO TISS LEAP VAULT Awards under 4 categories “ Global CLO of the year “, CLO of the Year , Best Blended Learning Program, Best L&D Team of the year in 2014. Partnership: The CLO leveraged our partnership with Skillsoft to develop a Learning Strategy Blueprint for UST Global which became the road map in taking learning to the next level. He partnered with Knowledge Advisors for measuring ROI and the Business Impact of learning initiatives. Learning Culture: He ensured that personalized learning by mapping learning interventions to employees’ roles (PELUS) based on the career framework of the organization. As a part of this transformation, the CLO was able to secure higher level sponsorship of senior leaders in delivering, designing and review of programs and for creating awareness among our Ussociates.